Platelet-rich plasma (PRP) can provide an assortment of growth factors, but how PRP effects bone regeneration is still unknown. The aim of the study was to explore an optimal method of using PRP and bone marrow stromal cells (BMSCs). An in vitro experiment was first conducted to determine an appropriate quantity of PRP. BMSCs were cultured with PRP of different concentrations to assess cell proliferation and osteogenic differentiation. Following the in vitro study, a rat femoral segmental defect model was used. Five collagen mixtures consisting of different concentrations of PRP and BMSCs were prepared as follows, i) BMSCs and PRP (platelet 20 x 104/µl), ii) BMSCs and PRP (platelet 100 x 104/µl), iii) BMSCs and PRP (platelet 500 x 104/µl), iv) BMSCs, and v) PRP group (platelet 100 x 104/µl), were used to fill defect. New bone formation was evaluated by soft X-ray and histologic analyses were performed at 2, 4, 6 and 8 weeks postoperatively. The cell proliferation increased PRP concentration-dependently. Cellular alkaline phosphatase activity was higher in moderate concentration than high or low concentration group’s in vitro study. In vivo study, the bone fill percentage of newly formed bone in BMSCs and PRP (platelet 100 x 104/µl) was 46.9% at 8 weeks and increased significantly compared with other groups. BMSCs with moderate level of PRP significantly enhanced bone formation in comparison with BMSCs or PRP transplant in a rat femoral defect model. Keywords: Platelet-rich plasma, Bone marrow stromal cell, Bone regeneration, Femoral segmental defect, Rat, Surgery. Recently, platelet-rich plasma (PRP), a platelet concentrate made of autogenous blood, has been recognized to promote soft-tissue healing or bone regeneration. In 1998, it was first introduced by Marx et al. in combination with autogenous bone grafts for reconstruction of mandibular defect . PRP contains an assortment of growth factors such as platelet derived growth factor, transforming growth factor beta, vascular endothelial growth factor and, insulin-like growth factor [1, 2]. These growth factors are considered to promote bone regeneration. However, the effects of PRP on bone regeneration remain unclear. Although the effect of promoting bone regeneration has been well demonstrated by clinicians and researchers [3-8], others still doubt the efficacy of PRP because obvious corresponding effects have not been shown [9-11]. In addition, while cellular proliferation by PRP has been shown [12-14], the effect of PRP on alkaline phosphatase (ALP), one of the markers of osteoblast differentiation is still controversial; some report increased effects, but others not [14, 15]. In these previous reports, concentrations and quantity of PRP differed, possibly leading to discrepant results on the effect of PRP. While PRP contains a variety of growth factors, increased concentrations of PRP do not necessarily enhance osteogenesis of bone marrow stromal cells (BMSCs). The optimal PRP concentration with BMSCs is still not clear. The present study intended to explore an optimal concentration of PRP for bone regeneration and to analyze the role of PRP in ossification, with a goal of achieving stable bone regeneration using a combination of PRP and BMSCs. An in vitro experiment was first conducted to determine an appropriate quantity of PRP to evaluate the proliferative and bone-differentiating potentials of BMSCs. Following the in vitro study, we performed an in vivo study on usefulness of PRP for bone regeneration in rat femoral bone defects and evaluated the effect of BMSCs and PRP in bone formation. Lewis rats (male, 4 weeks old) were used for this experiment. Rats were anesthetized with ketamine (Ketalar, Sankyo, Japan) (6 mg/100 g body weight) and medetomidine hydrochloride (Domitor, Orion, Finland) (0.04 mg/100 g body weight). The femoral bone marrow was flushed out with 10 ml of minimum essential medium (α-MEM, invitrogen, California) containing 15% fetal bovine serum (FBS) and antibiotics (penicillin 100 U/ml, streptomycin 100 μg/ml). Cells were seeded on a 100 mm dish and incubated in 5% CO2 at 37 °C. For this study, passage-2 BMSCs were used . Under intramuscular sedation, whole blood of Lewis rats (8-10 weeks old) was drawn from the heart into tubes containing anticoagulant. PRP was isolated by traditional two-step centrifugation. Centrifugation was carried out at 24 °C for 10 minutes at 600 g and the supernatant was transferred to another tube. Centrifugation of the supernatant, 2,840 g was conducted for 15 minutes at 24 °C. PRP and blood were counted automatically using a hematology analyzer (Celltac α, Nihon Kohden, Japan). Concentrations of platelets in PRP were adjusted as follows, 500 x 104/μl, 250 x 104/μl, 125 x 104/μl, 62.5 x 104/μl, 31.25 x 104/μl, 15.625 x 104/μl, and absence (control) for in vitro study. PRP was activated with 2% calcium chloride solution and bovine thrombin. BMSCs were plated at a density of 1.0 x 103 cells/150µl/ well in 96-well plates with 10 μl of PRP. The proliferation of BMSCs was measured on 1, 2, 3, 4 and 5 days using MTS assay kit (CellTiter 96 AQueous One Solution Cell Proliferation, Promega, Wisconsin). The assay was performed according to manufacturer instructions. This test was performed 5 times with 5 samples for each group. BMSCs were plated at a density of 2.0 x 104 cells/ml in 24-wel culture plates (1ml was added in each well) with 50 μl of PRP. On 2, 4, 6, 8, 10, 12 and 14 days, the medium was removed and cells were lysed with 200 μl of extraction reagent (CelLytic-M, Sigma-Aldrich, Missouri). ALP activity was measured using p -nitrophenyl phosphatase as a substrate (LabAssay ALP, Wako Pure Chemical Industries Japan). The assay was performed according to manufacturer instructions. This test was performed 4 times with 3 samples for each group. BMSCs suspension and prepared collagen solution (Cellmatrix type I, Nitta Gelatin Inc. Japan) were mixed at 4 °C to achieve a mixture of cell density at 2 x 106 cells/ml and a collagen concentration of 2.0 mg/ml. Five collagen mixtures consisting of different concentrations of PRP (200 μl) and BMSCs were prepared as follows, i) BMSCs/PRP(20) group of BMSCs and PRP (platelet 20 x 104/μl), ii) BMSCs/PRP(100) group of BMSCs and PRP (platelet 100 x 104/μl), iii) BMSCs/PRP(500) group of BMSCs and PRP (platelet 500 x 104/μl), iv) BMSCs group, and v) PRP group (platelet 100 x 104/μl). A two ml of collagen mixture (4 x 106/cell) was poured onto one ml of collagen gel leyer without cells in each well and incubated for 15 minites in 5% CO2 at 37 °C to prepare for collagen gels for implantation. To obtain a floating collagen gel, the attached collagen mixture was gently lifted off from the bottom of the 12-well plates and 2 ml α-MEM containing 15% FBS was added to the mixture. The collagen gel was then returned for incubation overnight and, having contracted. Then, two collagen gels with cells were implanted into each femur defect site. A rat femoral segmental defect model was used in this study . A 6-mm defect was made on the femoral diaphysis of recipient rats. Through an anterolateral approach, a high density polyethylene plate (4 x 4 x 23 mm) was attached to the lateral aspect of recipient femora (female, 8-10 weeks old). Six groups were prepared (Table 1). Two collagen gels described above were implanted in the femur defect site (Fig. 1). Our institution’s committee for animal experimentation approved all animal experiments (approval number 20045, Yamagata University Faculty of Medicine, February 20, 2009). Fig. (1). Transplantation of bone marrow stromal cells (BMSCs) in femoral segmental defect model. To evaluate the survival of transplanted BMSCs by fluorescence in situ hybridization analysis, BMSCs harvested from male rats were transplanted to the defect of female rat. Radiographic examination was performed using a soft X-ray apparatus (Softex; Softex Co, Japan) for 30 seconds exposure at 25 kV and 3 mA. Serial radiographs of rat femora were examined at 0, 2, 4, 6 and 8 weeks postoperatively. Levels of new bone formation were evaluated by soft X-ray. The total area to be analyzed corresponded to the entire area of the original surgical defect. Quantification of the bone fill percentage of newly formed bone was carried out using an image software package (ImageJ V1.41, NIH, Maryland). At 2, 4, 6 and 8 weeks after implantation, harvested femora were fixed in 4% paraformaldehyde in phosphate buffered saline (pH 7.2) for 48 hours. Fixation femora were demineralized in 14% ethylenediaminetetraacetic acid (pH 7.2). Samples were embedded in paraffin, cut into 5 μm sections, and stained in hematoxylineosin was examined via light microscopy. To evaluate the survival of transplanted BMSCs in newly formed bone, fluorescence in situ hybridization (FISH) analysis [17, 18] was performed on paraffin embedded histological sections of femur at 2, 4, 6 and 8 weeks after implantation. The rat Y-chromosome probe in plasmid was kindly provided by Dr. Barbara Hoebee (National Institute of Public Health and Environment Protection, Netherlands). The probe was labeled with digoxigenin by nick translation (DIG-Nick Translation Mix, Roche Diagnostics, Switzerland), and applied to the pretreated bone samples. Probe hybridization occurred over night at 37 °C using HYBrite (Vysis, Illinois). Hybridized slides were stained with rhodamin labeled anti-digoxigenin antibody, counterstained with 4', 6 -diamidino-2-phenylindole, dihydrochloride (DAPI). The survival rate of transplanted BMSCs was defined by Y-probe positive cell count in 100 non-overlapping nuclei in newly formed bone . To evaluate the vessel immunohistochemistry analysis was performed on paraffin embedded histological sections of the femur at 2 and 4 weeks postoperatively. Histological sections were treated in protein kinase solution for immunostaining. Platelet endothelial cell adhesion molecule-1 (PECAM-1, rabbit anti-human IgG, Santa Cruz Biotechnology, Texas) was the primary antibody used. Staining was performed using Vector Elite ABC kits (Vector, California). The number of blood vessel cavities was measured using two fields per slide viewed at x 200 magnification. The fields examined were at the border of the existing bone and bone defect (Fig. 2). Three rats were used in each group and immunostaining was performed 2 times with each sample. Fig. (2). Immunohistochemistry of vascular marker PECAM-1. To evaluate the vessel immunohistochemistry analysis was performed at 2 and 4 weeks after implantation. * The number of the blood vessel cavities was measured at the border of the existing bone and bone defect. The data was performed by one-way analysis of variance (ANOVA) using the SPSS 2. We evaluated significant differences between two groups by fluorescence in situ hybridization using the Mann-Whitney U test. A p value of < 0.05 indicated statistical significance. All of the results were expressed as the mean ± standard deviation. On days 3, 4 and 5, cellular proliferation was enhanced by the addition of PRP compared to control groups (Fig. 3). On day 5, the number of BMSCs with PRP (500 x 104/μl) was approximately a 4-fold increase compared to the control groups. Increases in the number of cells were PRP concentration-dependent. Fig. (3). Effect of platelet-rich plasma (PRP) on the proliferation of bone marrow stromal cells (BMSCs). The numbers of cells cultured with PRP with different concentrations of platelets were shown. (p < 0.05 * : versus control, † : versus 15.6 x 104/μl, ‡ : versus 31.2 x 104/μl, §: versus 62.5 x 104/μl, || : versus 125 x 104/μl, ¶ : versus 250 x 104/μl, ** : versus 500x 104/μl). On days 2 and 4, with the addition of PRP, ALP activity decreased compared to control groups. 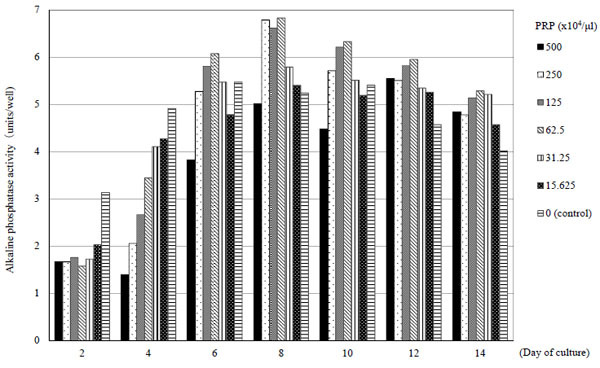 However, on days 6, 8, 10 and 12, ALP activity with PRP (125 x 104/μl, 62.5 x 104/μl) increased compared to control groups. Thereafter, ALP activity decreased over time, but maintained a state that was higher than control (Fig. 4). Fig. (4). Alkaline phosphatase (ALP) activity with platelet-rich plasma (PRP) of different platelet concentrations. ALP activity was increased with PRP (62.5 x 104/μl) on day 8. BMSCs/PRP (100) group showed a significant increase in newly formed bone compared with BMSCs and PRP groups (p < 0.05) (Fig. 5). The bone fill percentage of newly formed bone in the BMSCs/PRP (100), BMSCs, PRP (100) and control groups were 46.9%, 10.9%, 12.5%, 18.5% at 8 weeks. The bone fill percentage of newly formed bone in the BMSCs/PRP (100) group was 46.9% and increased significantly compared with other groups (p < 0.05) (Fig. 6). In the BMSCs/PRP (100) group, complete bone union was not realized, but it suggested possible adequate bone formation. Fig. (5). Radiographic findings. BMSCs/PRP (100) group showed significant increase in newly formed bone compared with BMSCs and PRP group at 8 weeks. (A-D) BMSCs/PRP (100) at 0, 2, 4 and 8 weeks postoperatively. (E-H) BMSCs group at 0, 2, 4 and 8 weeks. (I-L) PRP group at 0, 2, 4 and 8 weeks, (M-P) control (defect) group at 0, 2, 4 and 8 weeks. Fig. (6). The bone fill percentage of newly formed bone. BMSCs/PRP (100) group showed significant increase in newly formed bone compared with other groups. * statistical significance, p < 0.05. At 8 weeks in BMSCs/PRP (100) group, woven bone was partially observed, but lamellae bone was not adequately formed after transplant. 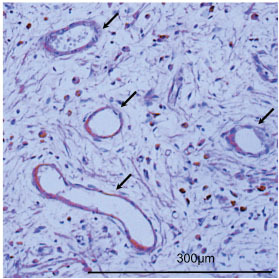 In contrast, the defects in BMSCs and PRP (100) group demonstrated sparse woven bone at the proximal and the distal end and connective tissue was observed within the defect space. At 8 weeks in BMSCs / PRP (100) group, bone marrow was found in the newly formed bone area (Fig. 7). Fig. (7). Histological findings (Hematoxylin-Eosin staining). (A) At 8 weeks in BMSCs/PRP (100) group, newly bone formed on the proximal fragment extended the length of the defect to the distal in histological section. (B) At 8 weeks in BMSCs/PRP (100) group, woven bone was partly observed. CB: original cortical bone, NB: newly formed bone, BM: bone marrow, WB: woven bone, LB: lamellae bone. The detection efficiency was found to be 71 ± 4.8% in male positive normal controlof the rat without defect. This indicated the probe worked sufficientry. The Y-probe positive cells were found in the newly formed bone tissue. In BMSCs/PRP (100) and BMSCs group, the survival rate of cells with Y-probe positive were 19.7% and 17.4% in newly formed bone tissue, respectively at 8 weeks after surgery (Fig. 8). 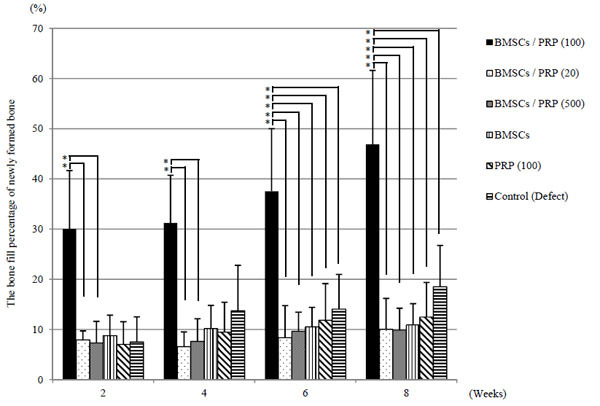 Ingrowth was more significant in BMSCs/PRP (100) and PRP (100) group than in the control group at 2 and 4 weeks. However, a significant difference was not recognized between the two groups (Table 2, Fig. 9). In the BMSCs group the number of blood vessel cavities formed were comparable to those of the control group. Fig. (8). FISH with Y-probe. The Y-probe positive cells were found in the newly formed bone tissue. The number of donor cells in BMSCs/PRP (100) group was similar to BMSCs group. Fig. (9). Immunohistochemistry of vascular marker PECAM-1 at 4 weeks after implantation. The number of vascular vessels after implantation in BMSCs/PRP (100) group. Arrow: vascular vessel. Table 2. The number of blood vessel. PRP has been reported to stimulate bone regeneration [5-8]. Recently, second-generation platelet concentrates such as platelet-rich fibrin and concentrated growth factor have been noted to slowly release platelet growth factor and enable healing of bony defect in vivo [19-21]. However, concentrations and quantities of PRP differed among them and the optimal PRP concentration with BMSCs is not still clear. 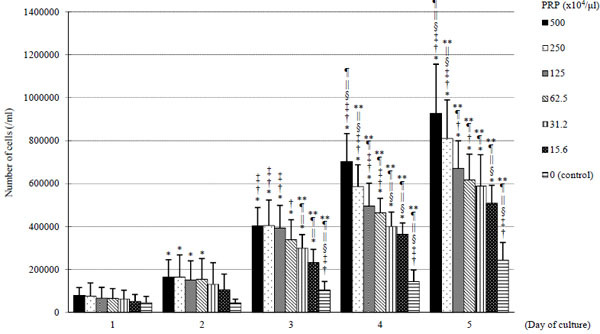 In this in vitro experiment, to evaluate the influence of PRP on BMSCs, comparative analyses were made among the 6 groups of BMSCs (PRP added in varying concentration levels). The number of BMSCs increased significantly from day 3 as compared to the control group and cell proliferation increases were noted to be PRP concentration-dependent. This finding was consistent with previous reports. We supposed that PRP stimulated BMSCs differentiation and enhanced the abilities of osteoinduction. 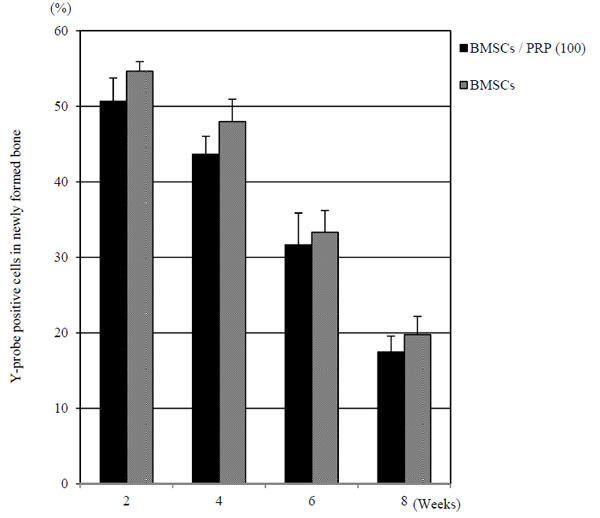 ALP activity in BMSCs was lower in the PRP groups when compared to control group until day 4 and decreased in accordance with the concentrations of PRP added. However, on days 6, 8, 10 and 12 after PRP addition, ALP activity was higher in the PRP 62.5 x 104/μl and 125 x 104/μl group than other groups. Because BMSCs increased by PRP addition in this experiment, it was expected that ALP activity by cell unit decreased. ALP activity in the whole cell was important to bone formation. ALP activity in each well was measured. In our in vivo experiment, PRP concentration was adjusted at 100 x 104/μl and ALP activity was higher. The ossification rate at 8 weeks in BMSCs/PRP (100) group was significantly higher than BMSCs, PRP (100) and the control group. Monteiro et al. reported BMSCs with PRP led to bone repair better than their control group in critical bone defects . In this study, sufficient ossification was achieved with a combination of BMSCs and PRP (100), although it was not possible with BMSCs or PRP (100) implantation alone. The ossification rate at 8 weeks after implantation in BMSCs/PRP (100) group was 46.9%, differing significantly from the rate in BMSCs/PRP (20) group (9.9%) and BMSCs/PRP (500) group (10.0%). Although both high and low concentrations (BMSCs/PRP (500) or BMSCs/PRP (20) group) were ineffective, a moderate concentration PRP (BMSCs/PRP (100) group) was effective for ossification. However, complete bone union was not provided in the BMSCs/PRP (100) group. Tsuchida et al. showed that bone morphogenetic protein-2 (BMP2) engineered allogeneic BMSCs could repair rat femoral segmental defect . It is thought that PRP is weaker than BMP2, but readily prepared from autologous blood and there is no special considerations concerning risk of infection. To investigate the role of implanted BMSCs in ossification, the present study evaluated survival rate of graft cells in newly formed bone. In BMSCs/PRP (100) and BMSCs group, the rate of Y-probe positive cells were 19.7% and 17.4% at 8 weeks. The transplanted BMSCs decreased because of immunological rejection and the percentage of BMSCs which differentiated via osteoblasts into osteocytes newly formed bone was low at 8 weeks after implantation. However, BMSCs/PRP (100) group showed abundant newly formed bone compared with BMSCs and PRP groups. It seems likely that PRP stimulated differentiation of host precursor cells through paracrine effect of transplanted BMSCs at an early stage after implantation. In previous reports, PRP promoted vascularization and ossification. Leach et al. made a 9 mm diameter bone defect in rat skulls and conducted an implantation experiment on two groups. The number of vascular vessels was significantly greater in the bioactive glass covered with vascular endothelial growth factor and bone mineral density was also higher than the bioactive glass alone. The investigator concluded that vascularization was important in ossification . In our study, the influence of PRP and BMSCs on vascularization was additionally evaluated using the rat bone defect model. The number of vascular vessels at 2 weeks after implantation in the BMSCs/PRP (100) group (49.6 ± 1.5) and the PRP (100) group (47.0 ± 4.0) differed significantly from that in the control group (30.7 ± 4.5). It seems that platelet derived growth factor and vascular endothelial growth factor containing PRP affected neovascularization in the tissue around the graft [23, 24]. The number of vascular vessels in BMSCs group did not differ from that in control groups, and there was no significant difference in the number of vascular vessels between BMSCs/PRP (100) group and PRP (100) groups. Thus, BMSCs alone exerted little influence on neovascularization but BMSCs implantation seems indispensable because ossification did not occur in the absence of BMSCs even when PRP stimulated vascularization. There are several limitations to this study. First, to evaluate the function of BMSCs, male BMSCs were transplanted to a female rat bone defect. Because transplanted BMSCs were rejected immunologically, we could not evaluate the possibility that new bone formation was delayed in this study. Second, it was thought that BMSCs differentiated into osteocytes because of the number of measured Y-probe positive cells found in newly formed bone. However, we could not examine in detail whether the transplanted BMSCs were differentiated into any cell with immunostaining. It would be better to examine fractures precisely with more refined methods. Third, it is unknown which of the growth factors included in PRP influences osteogenesis. Finally, we used early pubescent rats which corresponded to teenager on human in this study. In case of the clinical trial for human based on the current study, degree of bone formation may alter due to difference of age between rats and human. Thus, additional study on age factor as well as further investigation appropriate concentration of PRP in human would be required. PRP is readily prepared from autologous blood and there are no special considerations concerning risk of infection. In this femoral segmental defect model, BMSCs/PRP (100) group showed approximately a 3-fold increase in newly formed bone compared with BMSCs and PRP groups at 8 weeks after implantation. We showed that PRP alone has little effect on osteogenesis and established the importance of BMSCs with PRP transplant in order to obtain adequate bone formation. Regarding the volume of PRP added to BMSCs implantation, a higher concentration increased cell proliferation but decreased ALP activity. PRP was only effective for ossification when added in a moderate concentration. Determining the optimum platelet concentration for combination with BMSCs will be useful in devising a method of treatment for clinical use. A rat femoral segmental defect model was used for this in vivo study. BMSCs/PRP (100) group showed approximately a 3-fold increase in newly formed bone compared with BMSCs and PRP groups at 8 weeks after implantation. 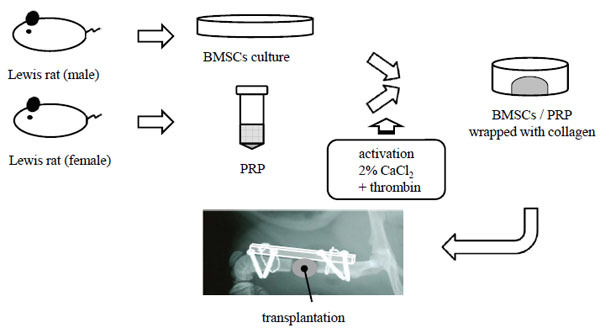 BMSCs with moderate level of PRP significantly enhanced bone formation in comparison with BMSCs or PRP transplant in a rat femoral defect model. The authors confirm that this article content has no conflict interest. Marx RE, Carlson ER, Eichstaedt RM, Schimmele SR, Strauss JE, Georgeff KR. Platelet-rich plasma: Growth factor enhancement for bone grafts. Oral Surg Oral Med Oral Pathol Oral Radiol Endod 1998; 85(6): 638-46. Roussy Y, Bertrand Duchesne MP, Gagnon G. Activation of human platelet-rich plasmas: effect on growth factors release, cell division and in vivo bone formation. Clin Oral Implants Res 2007; 18(5): 639-48. Wei LC, Lei GH, Sheng PY, et al. Efficacy of platelet-rich plasma combined with allograft bone in the management of displaced intra-articular calcaneal fractures: a prospective cohort study. J Orthop Res 2012; 30(10): 1570-6. Keskiner I, Alkan A, Acikgoz G, Arpak N, Kaplan S, Arslan H. Platelet-rich plasma and autogenous bone graft combined with guided tissue regeneration in periodontal fenestration defects in dogs. Int J Periodontics Restorative Dent 2014; 34(6): e112-20. Magesh DP, Kumaravelu C, Maheshwari GU. Efficacy of PRP in the reconstruction of mandibular segmental defects using iliac bone grafts. J Maxillofac Oral Surg 2013; 12(2): 160-7. Siebrecht MA, De Rooij PP, Arm DM, Olsson ML, Aspenberg P. Platelet concentrate increases bone ingrowth into porous hydroxyapatite. Orthopedics 2002; 25(2): 169-72. Thorwarth M, Wehrhan F, Schultze-Mosgau S, Wiltfang J, Schlegel KA. PRP modulates expression of bone matrix proteins in vivo without long-term effects on bone formation. Bone 2006; 38(1): 30-40. Weibrich G, Hansen T, Kleis W, Buch R, Hitzler WE. Effect of platelet concentration in platelet-rich plasma on peri-implant bone regeneration. Bone 2004; 34(4): 665-71. Aghaloo TL, Moy PK, Freymiller EG. Investigation of platelet-rich plasma in rabbit cranial defects: A pilot study. J Oral Maxillofac Surg 2002; 60(10): 1176-81. Jensen TB, Rahbek O, Overgaard S, Søballe K. Platelet rich plasma and fresh frozen bone allograft as enhancement of implant fixation. An experimental study in dogs. J Orthop Res 2004; 22(3): 653-8. Sarkar MR, Augat P, Shefelbine SJ, et al. Bone formation in a long bone defect model using a platelet-rich plasma-loaded collagen scaffold. Biomaterials 2006; 27(9): 1817-23. Choi BH, Zhu SJ, Kim BY, Huh JY, Lee SH, Jung JH. Effect of platelet-rich plasma (PRP) concentration on the viability and proliferation of alveolar bone cells: an in vitro study. Int J Oral Maxillofac Surg 2005; 34(4): 420-4. Ogino Y, Ayukawa Y, Tsukiyama Y, Koyano K. The effect of platelet-rich plasma on the cellular response of rat bone marrow cells in vitro. Oral Surg Oral Med Oral Pathol Oral Radiol Endod 2005; 100(3): 302-7. Uggeri J, Belletti S, Guizzardi S, et al. Dose-dependent effects of platelet gel releasate on activities of human osteoblasts. J Periodontol 2007; 78(10): 1985-91. Hu Z, Peel SA, Ho SK, Sándor GK, Clokie CM. Platelet-rich plasma induces mRNA expression of VEGF and PDGF in rat bone marrow stromal cell differentiation. Oral Surg Oral Med Oral Pathol Oral Radiol Endod 2009; 107(1): 43-8. Tsuchida H, Hashimoto J, Crawford E, Manske P, Lou J. Engineered allogeneic mesenchymal stem cells repair femoral segmental defect in rats. J Orthop Res 2003; 21(1): 44-53. Nilsson SK, Hulspas R, Weier HU, Quesenberry PJ. In situ detection of individual transplanted bone marrow cells using FISH on sections of paraffin-embedded whole murine femurs. J Histochem Cytochem 1996; 44(9): 1069-74. OLeary MT, Blakemore WF. Use of a rat Y chromosome probe to determine the long-term survival of glial cells transplanted into areas of CNS demyelination. J Neurocytol 1997; 26(4): 191-206. Honda H, Tamai N, Naka N, Yoshikawa H, Myoui A. 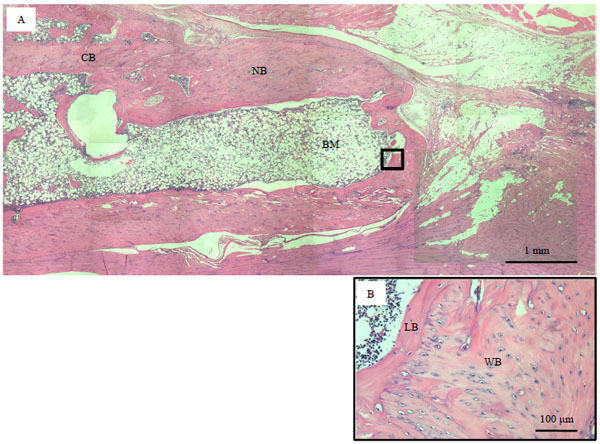 Bone tissue engineering with bone marrow-derived stromal cells integrated with concentrated growth factor in Rattus norvegicus calvaria defect model. J Artif Organs 2013; 16(3): 305-15. Kim TH, Kim SH, Sándor GK, Kim YD. Comparison of platelet-rich plasma (PRP), platelet-rich fibrin (PRF), and concentrated growth factor (CGF) in rabbit-skull defect healing. Arch Oral Biol 2014; 59(5): 550-8. Takeda Y, Katsutoshi K, Matsuzaka K, Inoue T. The effect of concentrated growth factor on rat bone marrow cells in vitro and on calvarial bone healing in vivo. Int J Oral Maxillofac Implants 2015; 30(5): 1187-96. Monteiro BS, Del Carlo RJ, Argôlo-Neto NM, et al. Association of mesenchymal stem cells with platelet rich plasma on the repair of critical calvarial defects in mice. Acta Cir Bras 2012; 27(3): 201-9. Leach JK, Kaigler D, Wang Z, Krebsbach PH, Mooney DJ. Coating of VEGF-releasing scaffolds with bioactive glass for angiogenesis and bone regeneration. Biomaterials 2006; 27(17): 3249-55. Gandhi A, Doumas C, OConnor JP, Parsons JR, Lin SS. The effects of local platelet rich plasma delivery on diabetic fracture healing. Bone 2006; 38(4): 540-6.